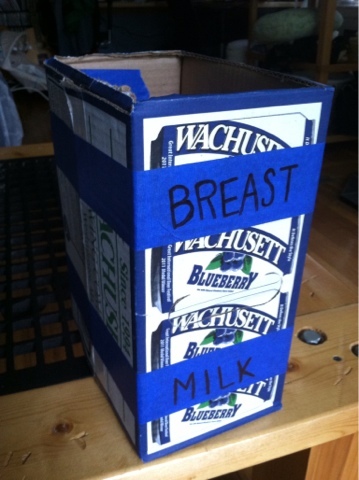 I have created a storage system for my breast milk, to keep in the freezer. This is a pretty simple idea, but it was fun to apply my engineering degree to motherhood. 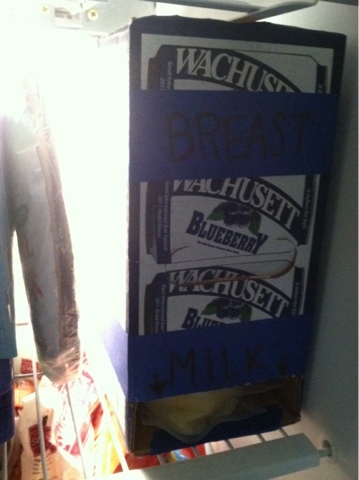 I created a gravity-fed kanban system for storing my breast milk!! First I had to find a cardboard box with the correct dimensions (5" x 8" x 11"). 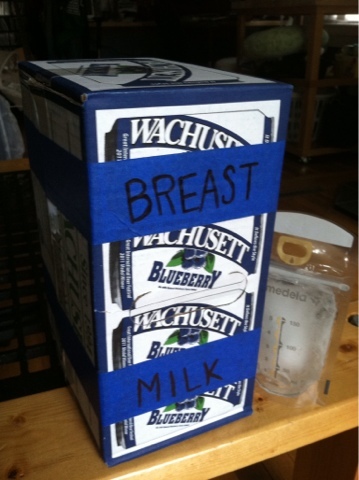 This was the hardest part (note: yes, we love Wachusett Blueberry beer). 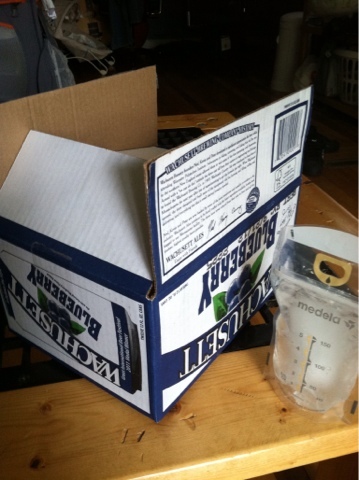 I also filled a breast milk storage bag with water, and froze it so I would have an accurate example of shape and size. 1. Tape the box so that the top (which will now be the side) wouldn't open easily. I took the opportunity to label the box, to avoid confusion when guests come over. 2. Cut the side off (which will now be the top) for dropping bags of milk in. 3. Cut a piece rectangle (1 1/2" x 5") out of the end of the side (which will now be the bottom of the front side) for pulling bags out. 4. Ta-da! 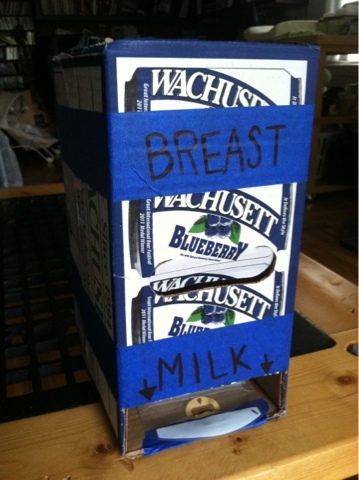 Free, cheap, and easy breast milk storage system!! Here it is, where it will come in quite handy. Now the "why" for this system. I wanted to follow the rule of "first-in-first-out" which means that you would essentially use the oldest bag of milk first. When putting a fresh bag of milk in the box, I will be dropping it in the top. That would leave the freshest milk on top, to freeze flat on top of the others. When needing a bag of milk for feeding baby Max, we would pull a bag out of the piece at the bottom. This bag would be the oldest of the bunch. Only one bag would come out at a time, which is why the piece is so slow. Many people may just have a Tupperware container that they may put their bags in, and do the FIFO (first-in-first-out) system. That works for plenty of people. I just like the gravity fed system, so that I don't have to move them around manually all of the time. Oh, and I'm cheap. So the sooner I can close the freezer door, the better! What do you think? Do you have a better system? I'm always looking for ways to improve and make things easier! Freaking genius! Love it! Thanks for the inspiration!